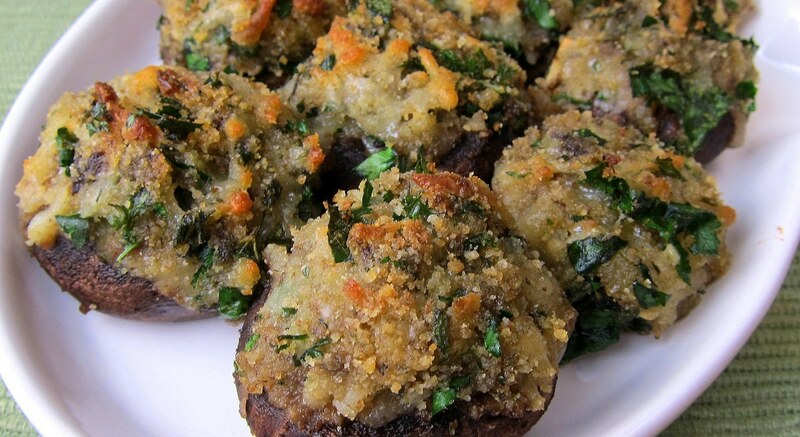 Mushrooms stuffed with cheese and herbs and baked to perfection. This is one dish you’d love to repeat as an appetizer before dinner, an evening snack or as a complete meal (if you want to have something light and different). Preheat oven to 400F. Grease a baking dish with non-stick spray. Remove the mushroom stems and thoroughly clean them. Mince and combine the herbs (parsley, thyme, oregano and sage leaves) and keep the mix aside. In a large bowl, combine the shredded cheese, breadcrumbs, ½ cup of the minced herbs, minced garlic cloves, and olive oil. Mix well. Add salt and pepper if necessary (Cheddar cheese is salty so add only a little salt). Stuff each mushroom cap with 1-2 tablespoons of stuffing. Press it inside with your hands to make sure the stuffing doesn’t fall out. Arrange the mushrooms in the baking dish, and bake at 400 degrees F for 17-19 minutes, or until the mushrooms are cooked and the stuffing is melted and starting to turn golden on top.